While we welcome the coming of autumn in Vermont, everyone resists turning on the heat for the first time. In fact, it becomes a matter of honor to be the last to fire up the wood stove or imbibe in a temperature boost from the furnace. Part of that reluctance is economic, of course. But part of it is…well…just plain old Yankee stubbornness, I guess. That’s a quality that Edie Wolfe’s cocker spaniel, Nearly, does not understand. 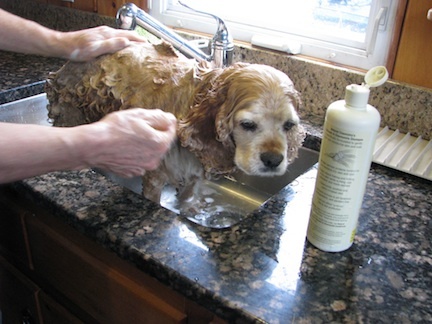 Now, Nearly Wolfe is renowned in the canine world as a patient dog. 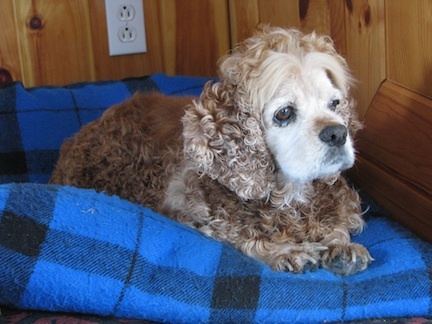 Over the years, the handsome cocker spaniel has taken the time to teach his human, Edie Wolfe, how and when to walk him three times a day, what part of his belly needs patting the most, and never to feed him raisin bagels. But he had never figured out how to get Edie to raise or lower the windows at just the right moment or to just the right level for him to maintain a constant exterior temperature of 72 degrees Fahrenheit. Take this morning, for instance. Judging by the fading plant life that passed by at his level, Nearly intimated that the long hot stretch of the year that was far from his favorite was drawing to a close. That meant cooler nights ergo, the window openings needed to be moderated. But Edie, who slept under a quilt except on the hottest of nights, seemed to enjoy the bracing temperatures, snuggling deeper and deeper under her covers until Nearly feared she would disappear all together. There was no doubt it was cold, and it was past time to do something about it. Nearly gave a leap, and landed in the middle of the bed, right where the covers were rucked up in small hills and valleys. 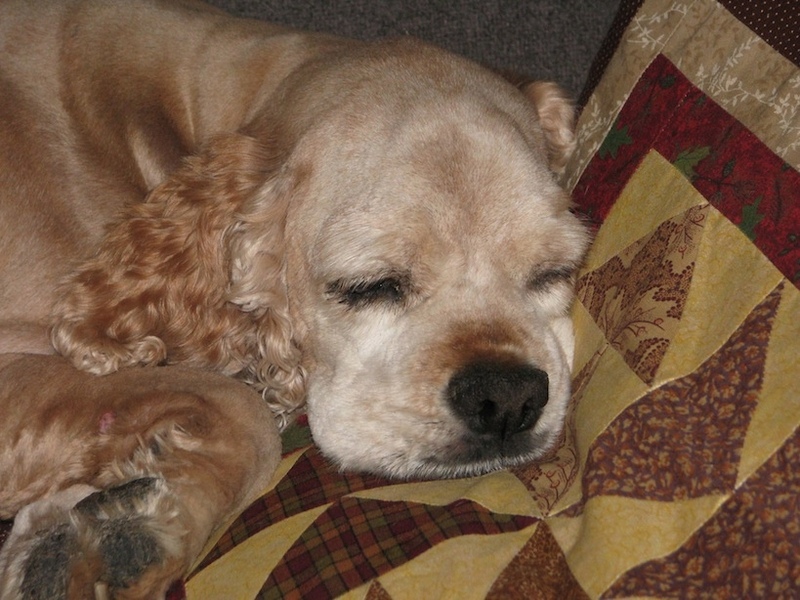 Edie started but did not wake. Warmer, Nearly lay down to wait for the fuller light of morning. 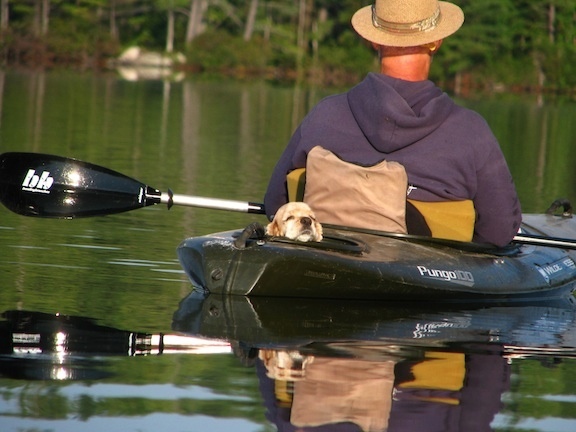 There would be a scolding—Edie welcomed her dog to sleep anywhere but on her handmade quilt—but Nearly knew it would be shortlived. Maybe next time, his human would moderate the window openings. Or make him his own quilt. Either way, he’d be happy. Edie gasped a little when her bare feet hit the wooden floor. Scurrying to the bathroom, she whipped a sweatshirt from the back of a chair, hurriedly yanked it on, and then crossed her arms over its front. 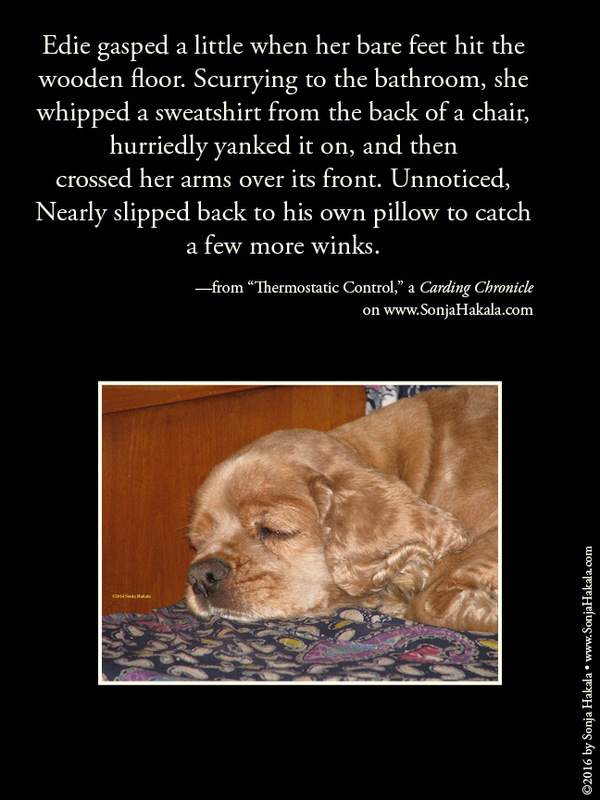 Unnoticed, Nearly slipped back to his own pillow to catch a few more winks. Soon he heard the slide-bang of closing windows as Edie whirled around the house. The tea kettle rattled next. Then with a loud “Brrrrrr,” she leaned forward to check the outside temperature on a large thermometer outside her kitchen windows. “Fifty-two degrees,” she huffed, and whirled around again to dig her slippers out of their summer resting place at the back of the coat closet. Nearly crept downstairs, dreading his first snuffle of the day in the backyard. It would be quick, he could guarantee that for sure. Edie squeaked a bit when she opened the door for her dog then dodged into the closet a second time to retrieve her favorite sweatpants. The kettle whistled, Edie poured, Nearly trotted back in, and then her eyes landed on the thermostat. The digital numbers reaffirmed that it was cold enough to justify a few moments of heat even if it was still September. But as Edie raised her hand, she thought about the bragging rights she’d lose over morning coffee at the Crow Town Cafe. “Yeah, it was cold but I just put on some heavier socks, and I was okay,” Andy Cooper would say. A taste of what’s in store for tomorrow’s Carding Chronicle. Warm and very humid today. The weather folks around here are predicting t-storms to clear this hard-to-breathe air out of here. Sure hope so because we all want to get out on our kayaks tomorrow so we want the rain in and out of here, followed by cooler and drier weather, stuff suitable for September, not mid-July. We did a recon mission last Sunday, scouting out good locations around the region for an upcoming article that I’m doing for Upper Valley Life magazine and we’ve scheduled ourselves to put into the Connecticut River up in Orford in the morning. Edie Wolfe just got back from a morning walk with her dog, Nearly. She gets asked about his name all the time, and this morning was no exception when a Joey (tourist) stopped her just outside the Crow Town Bakery when she called Nearly’s name. “You know, all dogs are descended from wolves so they are all ‘nearly wolves,'” she said. A small spark of comprehension glimmered in the eyes of her listener. “And it’s also my homage to one of my favorite series of detective novels, Nero Wolfe,” she said. The dog looked up at the woman at the opposite end of his leash. Edie shook her head. “I doubt that,” she said and they walked on to the post office to pick up the day’s mail. Carding, Vermont is getting around. 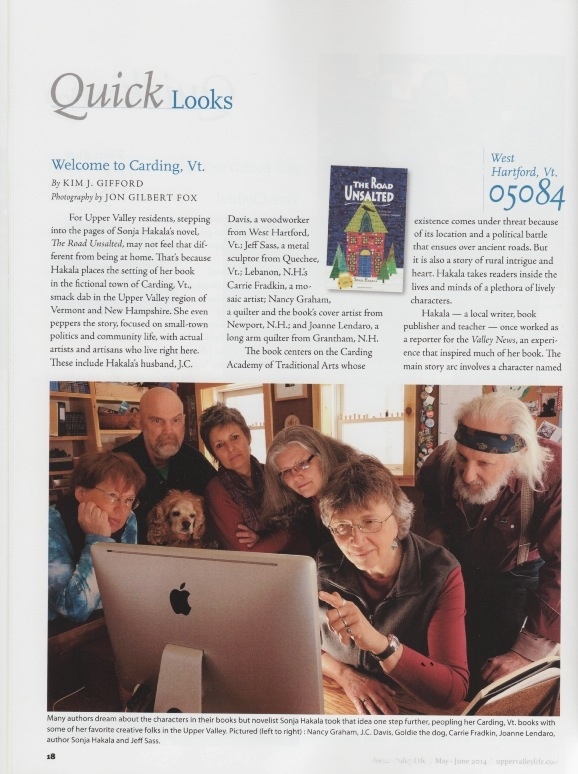 This month, Upper Valley Life magazine published a nice piece on our favorite town in the Green Mountain state. This image is one of two pages about The Road Unsalted. The article was written by Kim Gifford and photographed by Jon Gilbert Fox. I have to admit I wasn’t quite sure what Jon had in mind when he first described his idea for the photograph. But I’ve worked with Jon before and I know he’s got great instincts so I called the folks who are in The Road Unsalted and asked if they could come for a photo shoot. They were so good, taking time from their busy days, to make this happen. They are, from left to right, Nancy Graham who made the quilt that’s on the cover of my book; my husband Jay who’s a talented woodworker; Jay is holding our cocker spaniel Goldie who is the inspiration for Nearly Wolfe; Carrie Fradkin who’s a terrific mosaic artist; Joanne Lendaro who’s a long arm quilter among other talents, and Jeff Sass, our metal sculptor friend who lives up the hill. 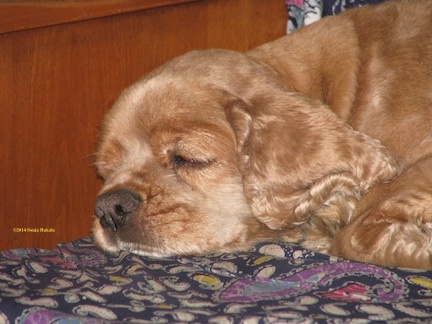 Our cocker spaniel, Goldie, is the inspiration for Nearly Wolfe in the Carding, Vermont books. We usually don’t let her fur (actually, cockers have hair like poodles so they don’t shed it once it gets to a certain length) get this long. But it’s been such a cold winter, we haven’t wanted to give her a haircut. In the last few days, the temps have started crawling on their hands and knees above freezing, and she’s sleeping further and further away from the wood stove which is a sure sign that her fur is making her too hot. We begin with the ritual bath which she ritually endures. Then we let her dry a bit. With her hair this long, she gets REALLY curly, and looks like a golden sheep. And then Jay gives her a haircut. Her hair is very fine and its length kept jamming the combs on the cutter. So Jay had to stop frequently to clean them. 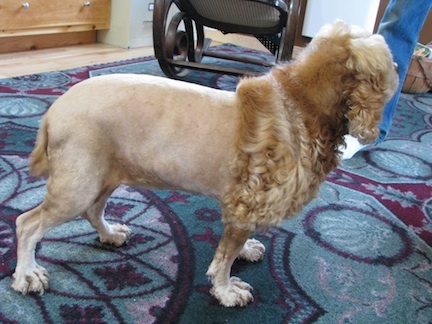 After an hour, which is about as long as Goldie can stand, her back end was sheared so we called a halt for the day. We often do this because we find that the shock of losing her whole fur coat is not as intense.